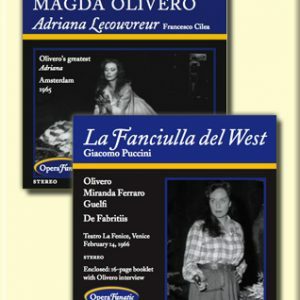 Olivero, Daniele Barioni, Guelfi, Zecchillo, Maddalena; De Fabritiis. Corrado Mirandola, Maestro del Coro; Carlo Maestrini, Regista, February 20, 1967; Orchestra e Coro del Teatro La Fenice, Venice. 20-p. booklet enclosed with Olivero interview. CD version includes 2 CDs. 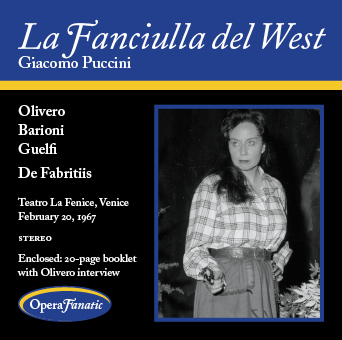 The card game in Fanciulla is one of the most elegant scenes ever written because Puccini does it with nothing. There’s only that tan-tan-tan in the orchestra, which is Minnie’s heart beating furiously. She has to find the way to trick Rance and win Johnson. When she cries for water, Rance turns his back. At that moment she raises her skirt, pulls three cards out of her stocking and substitutes them. Rance comes back and says, “Here’s your water.” She cries, “No, I don’t feel faint because I’m ill. I’m faint with joy because I’ve won! Three aces and a pair!” She places them in front of him. He puts on his hat, says “Buona sera!” and leaves–a stupendous scene. And done with nothing. The above remarks are from the outtakes to Opera Fanatic: Stefan and the Divas. February 20, 1967; Orchestra e Coro del Teatro La Fenice, Venice. Corrado Mirandola, Maestro del Coro.